Doing a quick post before I go to dinner. I am starving! When am I not anyway? The pastel and neon combination is brilliant! Love that pastel & neon combination!!! Oh Delmy! Only you could pull of lime green neon pants so well! I love how you paired them with pink. Perfection! So cute! You pull that off, perfect! Effortless! Great outfit! 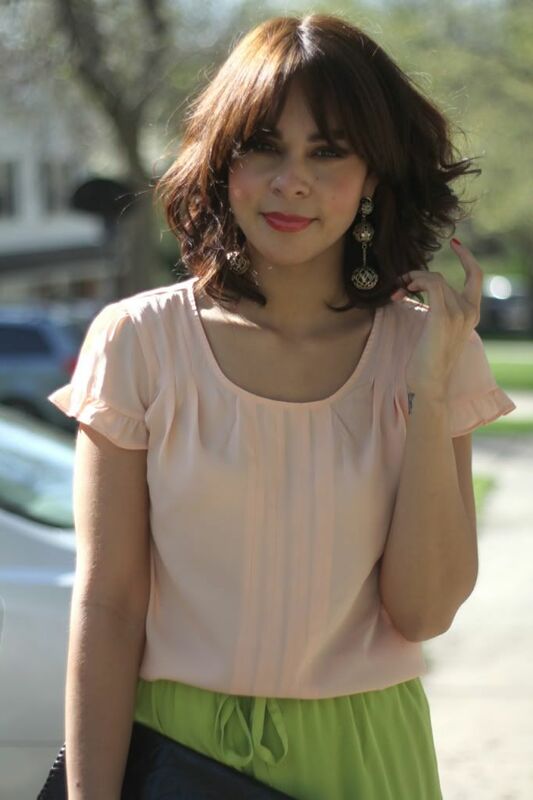 That blouse is so feminine and soft, love it! 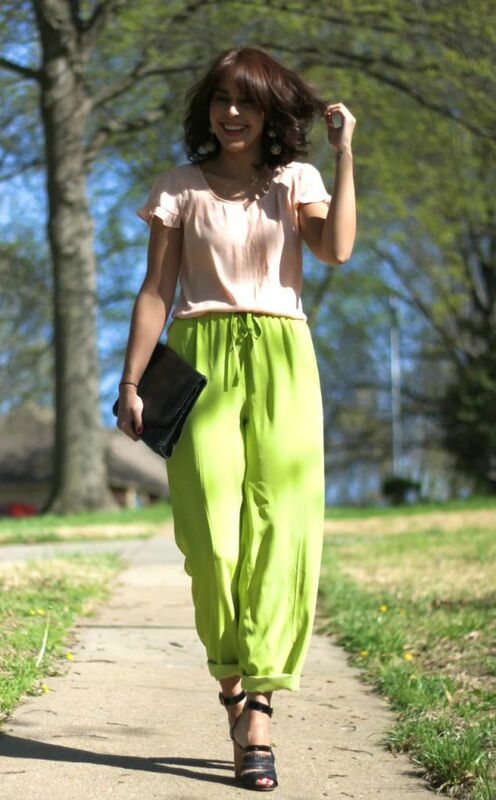 These neon pants are EVERYTHING right now. What I would do for a pair of those in my size, would be inappropriate to speak about under this post lol. I love it. i love those kind of pants because they fit perfectly. but this one looks stunning because of the color. that neon green is so fresh and perfect for spring. you have kept everything so stylish and sophisticated because of that beautiful blouse. the details are so adorable. sometimes black shoes can be too black with a delicate look, but these sandals look perfect. i love the clutch because of the details on the leather, so fascinating. What a beautiful green colour! Love neon and love your outfit!!! Such an unusual colour combination, love it! Love this mix of colors ! Beautiful as always ! I am in LOVE with you hair. Can you do a hair tutorial please ? you're really rocking those neon pants! great trousers - such a nice colour! What a beautiful combination of colourls! Wow girl! i like it! those shoes are too fab! You make neon green and peach look so good! the color combo is great! such a cute outfit. Sorry this does not look good...prefer your other outfits. Those earrings are SO cute! Great outfit! really love your hair color. how it can look like one shade of brown in some pictures but in others you can see the intricacies of the highlights. i live in the new york area and was wondering if you could tell me where you get your color done (and with who). i've been wanting to lighten my hair and would love to get something similar to yours - i've never seen such natural brown tones! Those pants are incredible! Love your clutch as well. I love this outfit, those pants look great on you ! 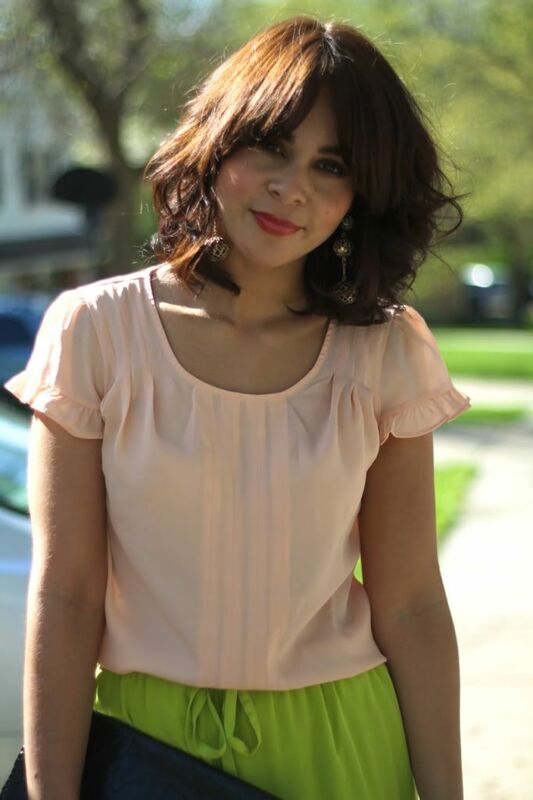 Glad I found your blog cause you have a great personal style ! i love the bright color trousers with the pale blouse!! the clutch is lovely as well!! I want to smile when I saw your blog !! Pink and green are my two favorite colors! You look great! I love that shade of green on your pants and your clutch is just gorgeous, love the detail on your clutch, it is really beautiful. Those pants are so dope!!! LOVE this look! Wow can't believe the pants are vintage! So cute! ooooh those pants are such a sweet find!!! i love it paired with that top! Amazing, I just fell in love with the pants! that clutch is sooo cute!! Lovely & unexpected color combo - totally works !